First, bags begin to form and become prominent around the lower eyelid. Next, volume loss begins to deepen the transition between the cheek bone and eyelid. This loss in volume is due to loss of fat, thinning of the skin and loss of bony support. Finally, fat in the mid-face begins to recede, hollowing the area below the eyelid and giving the area a droopy appearance. Improvements in endoscopic technology in recent years have enabled the mid-face to be targeted with minimally invasive techniques, igniting interest in surgical lifts to enhance the mid-face. The procedure starts with the surgeon making incisions underneath the eyelashes of the lower eyelids. The surgeon then frees the tissues of the midface from the underlying bone taking care to protect the infraorbital nerve (the nerve that provides sensation to the cheek, nose and upper teeth). He then proceeds to reposition, lift and suspend mid-face tissue before closing the eyelid incisions with sutures. This method is minimally invasive, versatile, and minimizes any scarring. Typically, most mid-face procedures take between 2 and3 hours. The exact time of your procedure can vary depending on your specific needs and desired results. Dr. Milan Doshi is a double-board certified Facial Plastic & Reconstructive surgeon who is highly specialized in facial surgery procedures. He takes an extraordinarily detailed approach to each procedure, and believes there is no such thing as a standard facelift. Instead, he customizes every facial surgery to the needs of the patient. It is Dr. Doshi’s ultimate goal to maintain the patient’s natural beauty. Equipped with unparalleled knowledge of the underlying structures of the face and vast experience in dealing with delicate facial nerve, the expertise of Dr. Milan Doshi makes Alluremedspa one of the most favoured destinations of patients seeking Face Lift from all over the world. Since confidentiality and utmost privacy of our clients are our prime ethics, Alluremedspa is the most favored choice of many celebrities for their corrective and cosmetic procedures. A mid-face lift procedure can be performed with local or general anesthesia. We at Alluremedspa care follow highest standards of privacy and confidentiality ensuring additional comfort for our patients.For your privacy and protection, we maintain a strict non-disclosure policy. During the first 2 days post procedure, the face may be wrapped in order to minimize swelling. Over this period, patients are advised to keep their head elevated and continuously apply cold compresses to the eyes and face. Since the surgery is performed around the lower eyelids, blurred and double vision is common for the first few days and subsides as the swelling goes away. Typically pain and bruising peak after 48 hours, with many people reportedly begin to feel dramatically better after that. Since the surgery is performed around the lower eyelids, blurred and double vision is common for the first few days and subsides as the swelling goes away. The mid-face lift procedure can dramatically define the cheekbones and reduce bags under the lower eyelids, restoring a more youthful contour in the mid-face area. The results of a facelift can last for years, and even when lines and wrinkles do start to appear, you may still enjoy a more contoured and defined face for life. Allure MedSpa which is renowned for its state-of-the-art internationally acclaimed services, offers affordable and cost effective cosmetic procedures. To know more about the cost of your procedure request a consult by filling the form Book a counselling session. Your consultation is your chance to ask questions about Mid Face Lift and put your mind at rest. Your surgeon will be able to offer you full explanations and answers to all of your queries. Alternatively, our counsellor will call you at your convenient time. Request a consultation right away: +91 9869041559. I am 54 years old and I have started looking like 64 now. My skin has started sagging. I look much older to my husband and many people confuse me for his mother. It is quite embarrassing. I tried to many methods to look younger but it was of no use. One day, as I was searching through the internet, I came to know about the Allure Medspa. I quickly made them a call. I had a chat with the staff and they connected me their head surgeon Dr. Milan Doshi. He was really a pleasant man to talk to. He asked me to send some of my photographs, so can evaluate the type of surgery that I should have. I did just that. Next morning I got a call telling me to come to India for my Mid Facelift Surgery. I made my tickets and flew there. When I visited his clinic Allure Medspa, I just felt just like home. The surgery was proceeded and within two hours of the surgery, I started feeling the difference. I was advised by the surgeon to follow proper diet and exercises and give proper rest to my face and neck. After few weeks, my bruises, which is minimal, started healing. As I have arrived to my own country, many people are praising my looks now. I no longer look like my husband\'s mother but his wife. I could not have been much happier. Good candidates for the eyelid lift include healthy patients who are looking to improve the appearance of eyelid bags and/or loose eyelid. Since swelling and bruising may occur after surgery, keeping the head elevated as much as possible during the first few days can help to alleviate the swelling. Bruising usually fades within two weeks. During the first few days of recovery after the eyelid lift, the eyelids may feel sore or tight. Medication can help to control any discomfort that patients experience. The stitches are removed in about a week after the eyelid lift. Depending on your health and other factors, a blepharoplasty can last as long as 10 years. 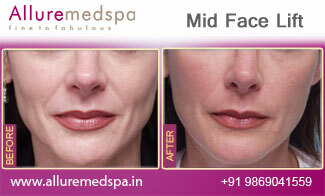 What is Mid Facelift Surgery? The mid face is the area that involves the cheek fat along with some of the area of the face. When skin starts sagging, it causes a very droopy face. It takes away the youthfulness from the face. 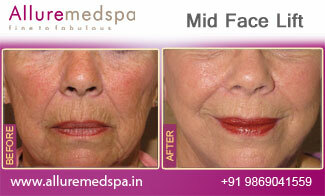 With the Mid facelift surgery, the cheek muscles is elevated to give it a more toned and firm look. What is the targeted area for Mid Facelift Surgery? The targeted area for Mid Face lift Surgery are nose, eyes, and corners of the mouth. These procedures are undertaken by patient who wants cheek elevation when the neck and areas beneath the chin do not require lifting. What are the different types of Mid Face Lift Surgery? The surgeon adopts two types of Mid Facelift surgery. The first is known as the traditional technique. In this technique, the surgeon makes incision in the lower lash line gaining access to cheeks and lower eyelids. Sometimes a surgeon will also make an incision in the nasolabial fold. This traditional technique is best suited for patients who wants to get their faces lifted. The second technique gives a more dramatic effect to the face. The procedure is performed through two endoscopic incisions placed in the temples, hidden behind the hairline. This allows the surgeon access points through which the facial muscles and skin muscle can be lifted both vertically and diagonally. The surgery will take couple of hour. You do not have to stay overnight after the surgery. You can head home the same day. The surgery will dramatically change your appearance. You can expect a more lifted and toned look after the surgery is done. To maintain the result, you should follow your surgeon’s advice and should pay visit for regular checkups. A patient will take 7 to 10 days to fully recover after the surgery. However, it varies from person to person. Your surgeon will advice you about the time you can return to your work. After 2-3 days complete rest you can start your work.